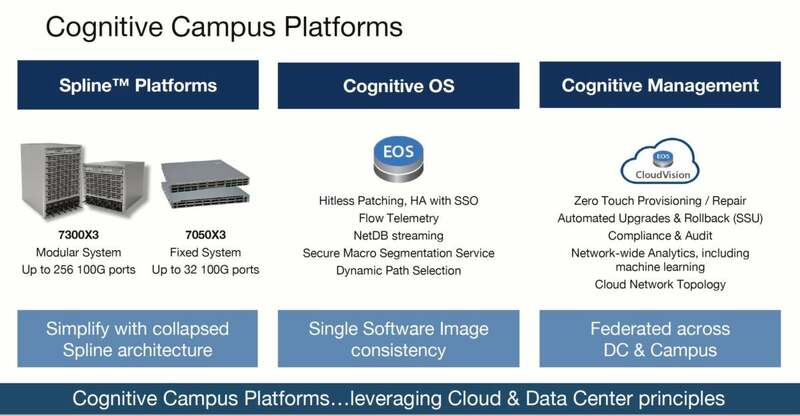 With its Cognitive Campus, Arista Networks brings the benefits of its spline, CloudVision and EOS operating system to the campus network. The rise of east-west traffic gave birth to the concept of a two-tier leaf-spine network, but Arista further simplified that down into a single tier. By collapsing the leaf and spine into a single tier, Arista is able to scale its network out rapidly simply by adding more switches to the spline — making it theoretically infinitely scalable. Arista took this model and applied it to data center interconnect, routing, and other use cases related to data centers. Earlier this week at its analyst day, Arista announced its first switching products that address the needs of the campus, specifically the campus aggregation and core layers. Its spline enables these two tiers to be collapsed into a single tier, greatly simplifying the architecture and allowing for rapid scale out. Its new 7300X3 and 7050X3 spline switches are the building blocks of what it's calling the “Cognitive Campus.” The 7300X3 is a modular system capable of supporting 256 100 Gig ports. The 7050X3 is a fixed system with 32 100 Gig ports. As is the case with all Arista solutions, the hardware is only part of the story. Its EOS operating system brings features such as hitless patching, streaming telemetry, macro segmentation, and dynamic path selection to the campus. Arista is not addressing the device connectivity layer. I believe that is a smart move for the company, as that requires products that have features such as power over Ethernet (PoE), multi-gig, and WiFi. For that part of the network, Arista is partnering with Aruba, a division of HPE. Another element of its Cognitive Campus is the CloudVision management tool that makes EOS simple to work with and provides network-wide visibility and analytics. Instead of doing things through a CLI, network engineers can perform tasks such as updating the operating system on hundreds of switches with a single click of the mouse. If something fails in the upgrade, the system is smart enough (hence the term Cognitive) to do an automated rollback. Also, almost all upgrades and security patches can be applied without having to reboot the switch, ensuring continuous operations. In its history, it has issued thousands of patches and updates and only once did it require a reboot. 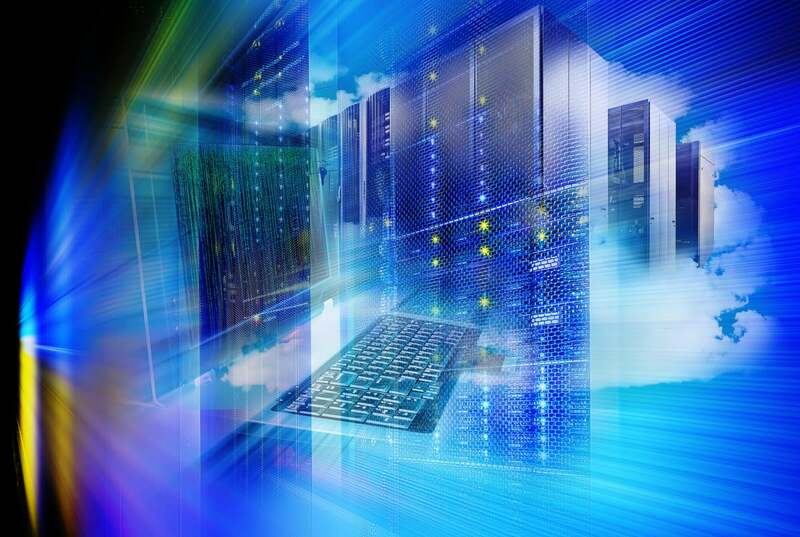 CloudVision provides end-to-end visibility of the network — from the cloud, to data, and to campus — breaking down the historical lines of demarcation. Instead of thinking of a “data center network” and “campus network,” network engineers can consider a single network with consistent features across it, simplifying the network more. I’d like to add my thoughts here on the importance of simplification. Almost every IT professional I talk to discusses the importance of modernization of infrastructure. For the network, that means security, automation, and increased resiliency. I fundamentally believe that step one of any modernization effort must be simplification. Trying to modernize a complex environment will likely make things more complicated. By simplifying the architecture first, it’s much easier to understand dependencies, vulnerabilities, traffic flows, and other issues that need to be dealt with. Continuous operations have obviously been very important in the data center, and now it is becoming critical to the campus. The rise of the Internet of Things (IoT) gives the campus network the same level of mission criticality as the data center, so maintenance windows have gone from hours to minutes to “if you take down the network, you take down the business” — putting engineers in a tough spot. I’ve talked to many network professionals who haven’t updated their campus network in months or often years because they did not want to have to shut the network down, even for a short while, and who live with the “if it ain’t broke, don’t fix it” motto. Arista’s sophisticated software and hitless upgrades, however, allow for continuous updates without having to cause planned downtime. One interesting aspect of Arista’s approach to networking is that it was built with cloud principals in mind. During his presentation, Arista's co-founder, CTO and SVP of Software Engineer, Ken Duda, mentioned that cloud providers live and die with data, so they never, ever throw any of it away. Historically the network has used sampling techniques such as SNMP that capture data only periodically and then keep it for a limited time. Arista, however, streams all its telemetry information and keeps it forever. This has some interesting long-term implications for Arista and its customers. Artificial intelligence is becoming a bigger part of the world and will soon impact network operations. Success with AI is based on data, and Arista is capturing massive amounts of it. AI and all of its telemetry information could enable Arista to take the concept of “cognitive” to an entirely different plane. The industry hasn’t seen a wide scale campus upgrade since Y2K. Trends such as the need for better security, cloud computing, and IoT are causing customers to look at the campus and refresh what’s there — giving Arista an opportunity to move into the market. As successful as the company has been in the data center, it’s success in the campus by no means is a fait accompli. Most businesses prefer to purchase the core, aggregation, and connectivity layers from the same vendor. Arista has no edge products, but it is partnering with the Aruba business unit at HPE and the two combined can bring a compelling solution to market. Over time, I’d like to see some integration between the two companies. Aruba has been one of the most successful and innovative companies at the edge, and the combination of the two certainly has strong potential. Note: Arista is a client of ZK Research.